A side of History that you have to Taste! Chef Walter Staib travels the globe, to historical locations, into famous kitchens and exotic markets to bring you A Taste of History. The cooking TV series explores, educates, and brings Americas culinary heritage to life through the recreation of elegant and sumptuous dishes inspired by the founding fathers. 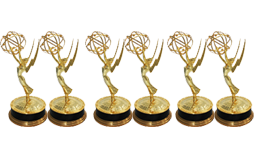 A Taste of History, is an Emmy Award-winning program, seen nationwide on Public TV and RLTV. Stay tuned for the most delicious, and thought-provoking TV of your life as Chef Staib cooks exotic and significant recipes of historic proportions: venison, pheasant, ostrich, and eel; fry fish, celery, calves feet, and oysters; sauté wild mushrooms and kohlrabi, braise beets and sunchokes, and go back to the classics, with stuffed cabbage, mashed potatoes, turkey stew with egg noodles and beef brisket. Bake bread, tarts and Martha Washingtons Chocolate Mousse cake, follow along as the adventures in history continue. A Taste of History brings 18th century, colonial America to life in places like Jeffersons Monticello or at Washingtons Crossing on the Banks of the Delaware River. But sometimes the program reaches beyond our shores to profile island delicacies and local chefs on the beaches of Jamaica, Turks & Caicos or Grenada. Then, there are more exotic locations such as a Malaysian jungle, by the waterfalls of Guyana and on top of the Great wall of China. In Japan, Chef Staib learns the customs of geisha in Kyoto. In France, he sets sail on Lafayettes frigate of Freedom and prepares a tribute dinner to the Marquis. 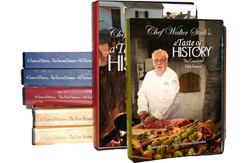 No matter where he travels, Chef Walter will always return to you with A Taste of History. 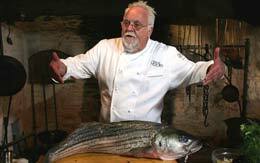 Join Chef Walter Staib for an exciting Season Seven of A Taste of History. Follow Chef Staib as he takes you to Barbados, the only place George Washington traveled to outside of the America. Witness the great work of Charles Thomsons Great Seal of the U.S.; Jump in to the Modern father of Psychiatry in Philadelphia, Dr. Benjamin Rush also a signer of Declaration. Chef Staib will then bring you over to Cognac to meet the Hennessy family. Enjoy a mouthwatering Sinful Feast at Elizabeth Powel house. Join Chef Staib at the 11th presidents James Polks original home in Columbia, Tennessee. This season is packed with history at its finest. In the sixth season of A Taste of History, Chef Staib makes it personal. He tours viewers through his 18th century restaurant, City Tavern, and goes on a voyage home to the Black Forest to cook with his mom in her kitchen. Chef Staib also travels to London to Ben Franklins house, the Great Wall of China, St. Lucia, France and much more. He goes to The Jefferson Pools in Hot Springs, Virginia, to nutmeg groves in Grenada, battlefields along the Delaware and cooks local, historic dishes, such as roast leg of venison, braised rabbit, gingerbread and poached pears, to name a few. In season five, Chef Walter Staib delves into historic locations near and far, including a trek to South Africa, a journey to Americas western plains to experience native American culture and cuisine, and a flight to Kyoto and Kobe, Japan to learn about the ancient art of sushi and beef. Chef Staib cooks Johnny cakes in Nassau, does a tribute to the Liberty bell, the Start Spangled Banner and to the King of Prussia. He travels back in time with recipes including short ribs with red polenta, roasted veal shank, Hungarian goulash, liver dumplings, Kobe beef and for dessert, corn and cranberry pancakes, Martha Washingtons chocolate mousse cake and apple strudel. Chef Walter Staib cooks in the kitchens of George Washingtons Mount Vernon Garden & Estates, James and Dolley Madisons Montpelier, Charles Thomsons Historic Harriton House, John Bartrams Gardens, and visits the shores of Jamaica & Exuma to bring the cuisine of the 18th century alive! Inspired by his visits to historical locations, he cooks roasted, stuffed grouse, veal kidney dijonaise, curried tofu with shrimp, roasted leg of lamb, beef olives, mashed potatoes and more. 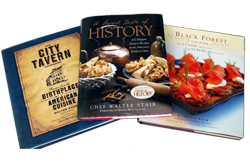 Best known as the acclaimed chef and proprietor of Philadelphias City Tavern, Walter Staib brings American history to life. From Colonial Williamsburg to the historic Harriton House, he explores Americas culinary beginnings and gets to know such notables as Charles Thomson, Dr. Philip Syng Physick, Betsy Ross, General Lafayette and more through the food they ate and the recipes they prepared. Chef Staib cooks meals inspired by his historical heroes over an open hearth, including Virginia ham, citrus marinated salmon, crow roast of pork, vol au vent with sweetbreads and more. In the first season, Chef Walter Staib premieres his show at telling tales and cooking famous recipes of the Revolutionary War in America. From ladling up Pepperpot Soup at Washingtons Crossing to stuffing cabbage in Thomas Jeffersons kitchens at Monticello, Chef Staib travels deep into history to bring forth the recipes of the past. He learns about Martha Washington, Ben Franklin, the wines of Madeira, the spices of the West Indies and more.